I needed a some home storage cabinets in my 'just built' steel kit home. We didn't plan in a lot of storage and like most new homes, needed a lot more. Our hallways were 1.5m wide so we had room there, and close to the open plan area was a practical position. 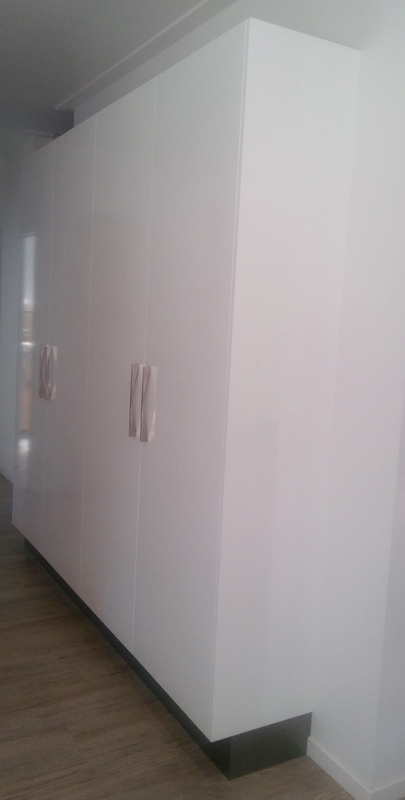 A number of storage solutions were considered, but this one needed to tie in with the adjacent kitchen so I got the kitchen builder quote and deliver the product we wanted. A flatpack was only 20% cheaper so I opted for the fully installed price at under $2000. 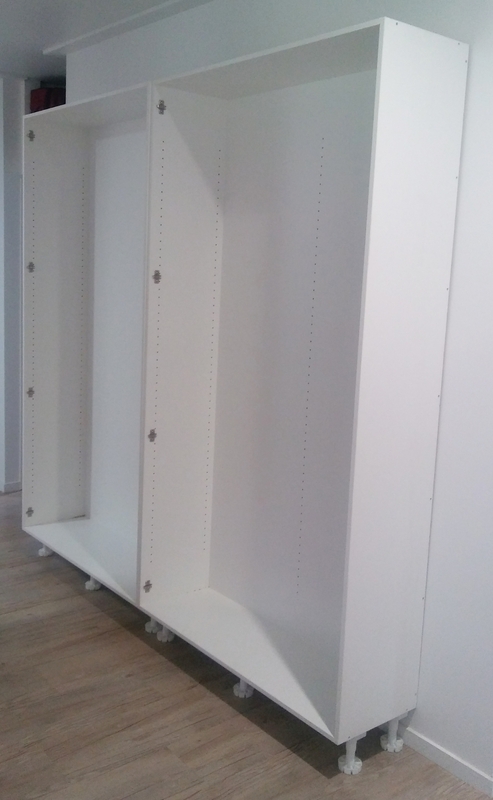 The dimensions were 2.4m wide by 2.4m high by 400mm deep with four soft close doors and adjustable shelving. These could also be used for bed room storage. 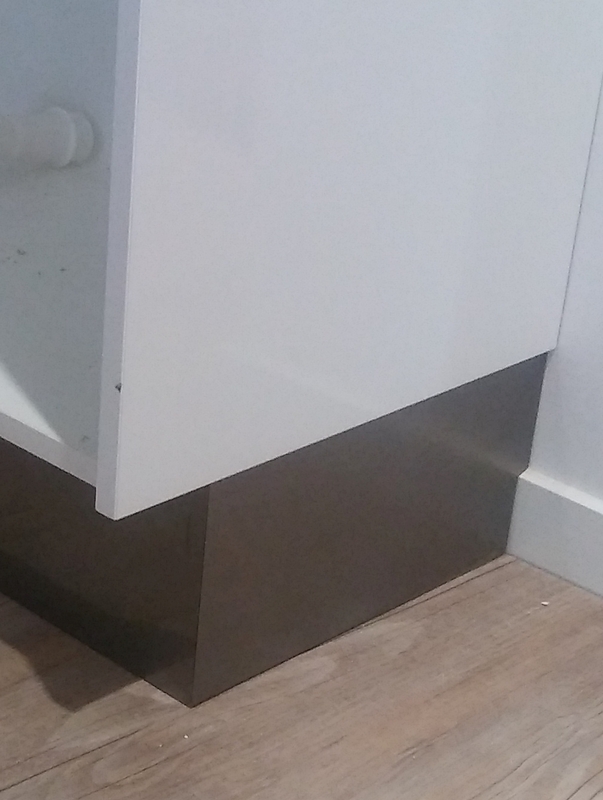 The cabinet was made up of two 1200mm carcasses which were pre-built at the factory, with sides, bases, backs, base feet inserts and shelf level holes pre-drilled. The plastic base feet supports were snapped into the inserts and the unit was positioned up against the wall. 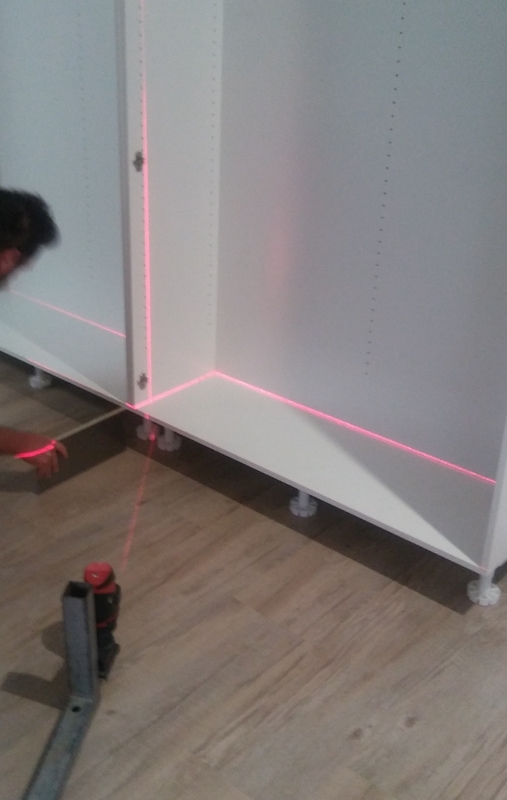 A laser unit was deployed to get exact levelling of the base. The supports were adjustable and were screwed until a perfect level was achieved with room to squeeze under the kickboards. The two carcasses were then screwed together, and attached to the wall. The kickboards were then positioned, measured, mitre cut to length, and checked out to fit around the skirt moulding. 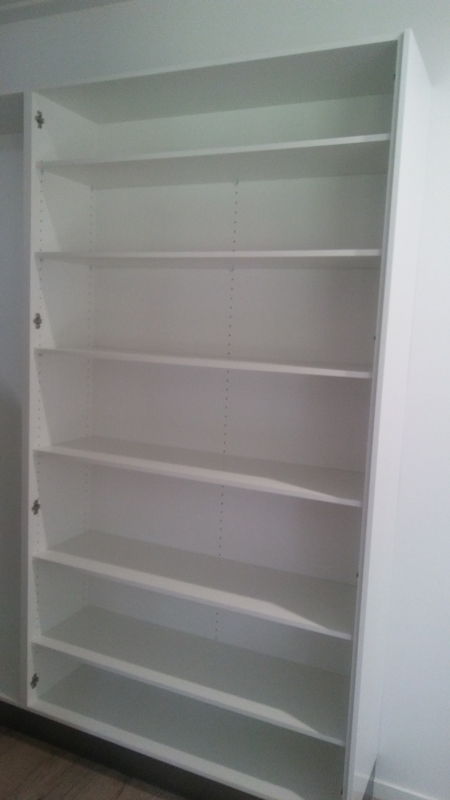 The next step in the installation of my home storage cabinets was the side facades which were cut to fit and screwed on from the inside of the carcasses. Then the hinge receivers were installed ready for the doors. At this point all of the shelving was slid in to sit on the adjustable supports. The four doors were each snapped onto their four receivers and closed. 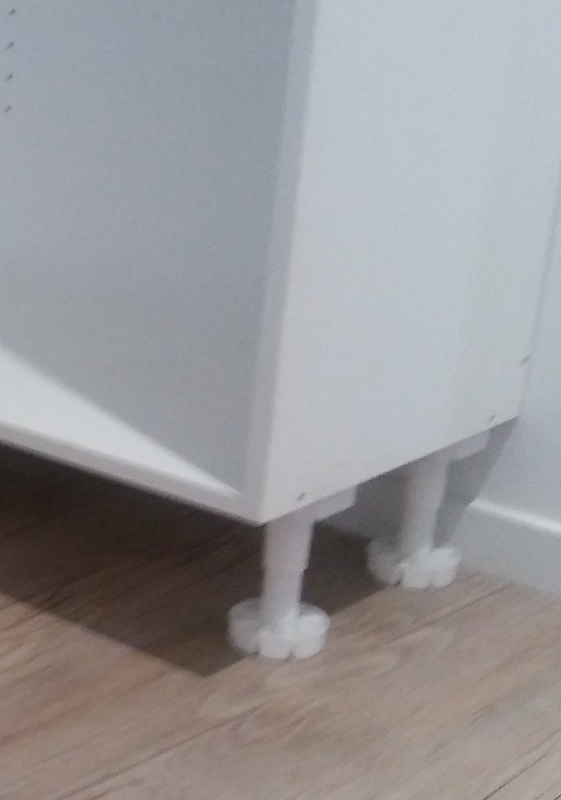 The handles were then attached and the finishing began. 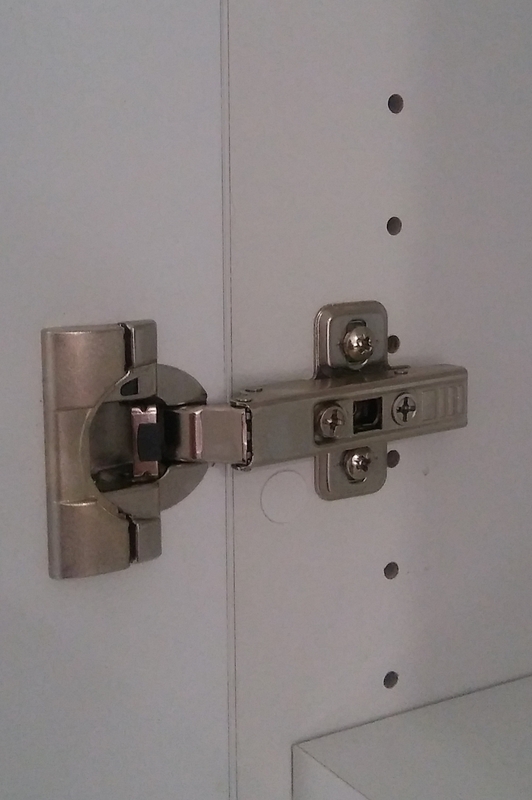 The doors were adjusted until a 2mm gap was set up between each door, top to bottom, and the doors were also adjacent to the facades right across the unit. Lastly a bead of no-more-gaps was applied down the wall to the floor. We then stocked it with a plastic storage box or two full of manchester, wine storage racks, files storage, and overflow non-perishable storage containers. or go back to kithomebasics home page.